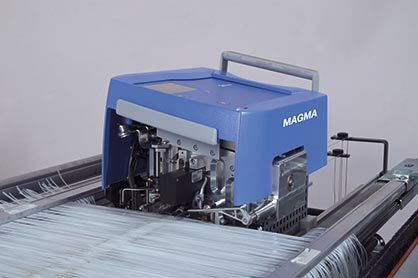 Magma T12 – the warp-tying solution for technical yarns - This tying machine processes monofilaments, coarse multifilaments, PP tapes, bast fibres, coarse staple fibres and many other yarn types. LXL/LXXL Jacquard machines for producing complex OPW (one-piece woven) airbags - These machines feature lifting motions that ensure precise shedding geometry and absolutely vibration-free movement even at high speeds. The optimally coordinated kinematics of all moving parts within the machine and the directly mounted components such as the drives enable routine weaving of very heavy fabrics. The shed opening is optimised and loads on the warp threads during weft insertion are reduced. The robust construction and uncompromising use of high-quality materials guarantee the reliability and longevity of every machine. TF20 weaving system for complex multi-layer fabrics - Individually configurable, this system allows the production of flat and spacer fabrics, complex and very thick and/or dense multi-layer fabrics, as well with material mix, and 3D textiles. ALPHA 500 LEANTEC for manufacturing high-quality artificial turf - This specific weaving system of the Schönherr Carpet Systems product line enables the economical production of high-quality synthetic turf and greige woven carpets.